Clams are used widely in Konkani cooking. ‘Aghanashini’ river flows at our native. During the low tide days, people stand in knee high water and pick up the clams. While using for cooking, the clams are opened carefully and the soft meat inside the shell is used in a variety of dishes. Usually one of the two shells is kept intact for some clams. I do not know why the shells are used, but when we were kids we always fought with each other to get the shells :D. It was a competition to see who got more shells. There are many types of clams used in cooking. We used 3 types of them. First one is called ‘Tisre’ in Konkani. It looks like this and has many lines on the shell. Second type is called ‘Khubbe’, which doesn’t have the lines. Some people eat the first type and do not eat the second and vice versa. (Some more information about these types can be found here).The third type is called ‘kalva’, these are found in big stones near the sea shore. Any of the three types of clams can be used for this dish. Few days back, Kalpita sent me a very sweet mail. She had asked to post ‘Tisre sukke’ here. When I searched in the nearby Chinese store, I found the cooked ‘Kalva’ in the frozen section. There were many types of clams available in that store. All of them were too big. Usually the big ones cause stomach pain, so I almost left the hope of getting the good ones. Then I saw ‘Fresh water cooked clams’ in the frozen section. See Mahek’s version of Tisre sukke here. Add the masala and cook. Heat oil and fry coriander seeds. 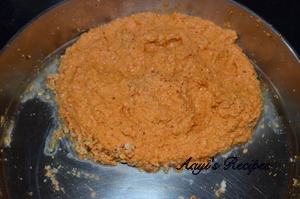 Grind them with chillies, tamarind and coconut to a smooth paste adding very little water. 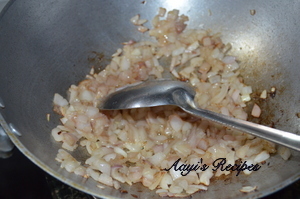 Heat remaining oil and fry onion till they turn slightly brownish. 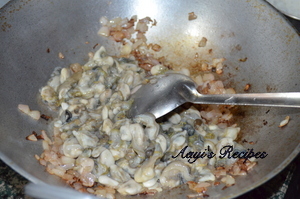 Add potato cut into cubes, clams and fry for a minute. Add ½ cup water and cook for around 10 mins. 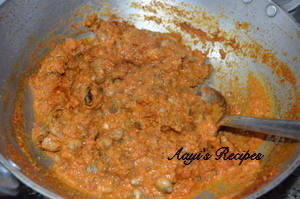 Now add ground masala, salt and cook till all water is absorbed and a dry dish is got. Serve hot with rice as a side dish. It is lot of fun if few of the shells are left intact while using for cooking. My mom never adds potato to this dish, but few people like it with potato. I have fond memories of trying to open the stones/rocks to get kalwa maas, as a kid in my mom’s native-Shirali. I’m not sure if my mom asked me break open rocks to get to the yummy stuff or to just keep me occupied. I’ve been craving this food for a long time, but had no guts to bring home some, from the chinese store. Your tip on finding the frozen stuff has sure renewed hopes!Thanks a bunch! This dish looks delicious,are clams and mussels the same? Do you know what it is known in Kannada or malayalam Shilpa? Hi Shilpa, Can I try you clam recipe with prawns also as I love prawns. Thanks all. Sumitha, it is called as Belchu or maruvayi or moLi in native Kannada. But I do not know what are they called in bookish Kannada :(. I am very sorry about that. Please have a look at the links I have mentioned in the mail, you might get an idea. Massels are big compared to clams. 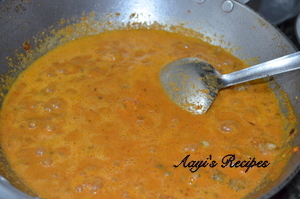 Anupama, I have never tried this dish with prawns. May be you can give it a try. its a superb dish,it makes me think of my mamale ghar and her dishes,thank u so much ,i will surely gi ve it a try.once again thank u soo much . Do you guys know what do they call “kalwa” in english. Do stores carry them in United States ? Nad, as I mentioned, they are called as ‘ fresh water clams’, I found them in Chinese store here in US. Hey anyone knows the redipe for “Tisrya Maasache Wade” which is nothing but vade made out of shelled clams? My granny used to make it 25 years ago (shes no more & I fondly remember her for this dish)though rarely as shelling them to get just the meat was a tedious task, so we mostly had Tisryache Ambat, but would love to see this recipe. hi, Just came across your website today. Great to see some good Konkan food. We are from Goa and many of your terms are familiar. Kalva are oysters. We call mussels shinanio. Tisreo are the large smooth clams and the tisreo as you say the smaller ridges ones. I love all seafood (part of being Goan, I think). I came across your lovely website. I come from Cuncolim, Slacete, Goa. I now live in the U.K. 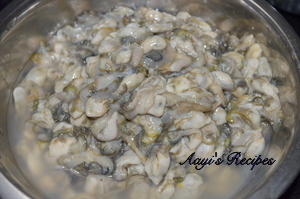 I have lots of memories when mu mum used to cook for us, specially, Tisrio(clams) and Kalwam(Oysters) I shall be very grateful if you could kindly let me know how to make a nice caldine of Kalwam(Oyisters). We buy frozen very large oyisters from Chinense shops. They are not completely fresh, but may have been harvested for a quite sometime, and frozen. But they are O.K. Ambot tick does not come out nice but caldine may be quite tasty. Also we get frozen(not fresh) clams. I tried to fry some onions, and then add these clams, put some water and green chillies. Threy open up after a while, but when you try to eat them, they are full of grit(sand). Don’t know how to remove the sand. Please kindly give me some idea. , I look into your site often, I just passed by this recipe. I come from Kundapur and we have a slight variation for Kubba sukka. 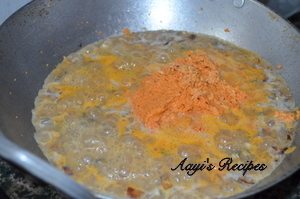 We add ground( roasted bolied rice, red chilly and bit Garlic) powder, right after the onions and green chillies. After its cooked, then we add coconut. You should try this variation, its addictive. 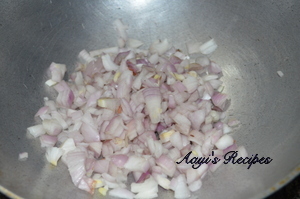 Welcome to Aayi’s Recipes Joseph. Usually we wash the clams very well before cooking. That takes care of the sand. If possible, wipe each clam with a damp cloth. Thats all we can do to avoid sand. I will see if I can get any more tips. This is an awesome recipe! !Back in Goa we also add wedges of raw mango i.e ambli to tisrya sukke and it tastes great!!! Shilpa: Surekha, I am sorry, I don’t have recipe. I have never been to the Hotel you have mentioned and have no way to find it out. If it was a popular name, I could have found out, but dishes specific to one hotel cannot be found out easily. This is the best foodsite I have ever seen.You and your Aayi are really doing a great job.I am a Goan and the mere words like Tisryo,Kalva and Shinani drive me crazy.Please tell me where you can get kalva in the US.I will be indebted to you. Shilpa: Its available in Chinese store at our place under the name clams. Yet another mouth-watering recipe on ur site.I recently bought a huge double pack of canned clams from Costco. (I live in CA).I have been wanting to make a curry I had at a friend’s place but she doesn’t want to share the recipe.She’s a Konkani & she only told me that she just put some random masalas (?!?!) and did it. 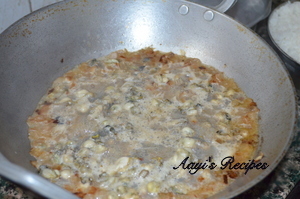 (And the curry was yummy-I had it with rice).Would you happen to know how this curry is made?It was flooded with clams & it was kind of like a thick curry/side that u wud probably eat with rotis.I am dying to make about a tonne of it & eat it at home but I am stuck zeroing down the recipe.Please HELP!!! I’m going to try this recipe soon. I find that frozen clam meat gets a bit rubbery when cooked. Canned baby clams are far better to cook with, they did not get rubbery last time I used them. Maybe I am not using the correct cooking method for the frozen clams. Yes it is very tasty and looks very different.Thank you sharing with us. Lots to share, Lots to laugh about!!! LOTS to reminice about. Even i enjoyed picking up clams from the Creek in Devbagh, Malvan. 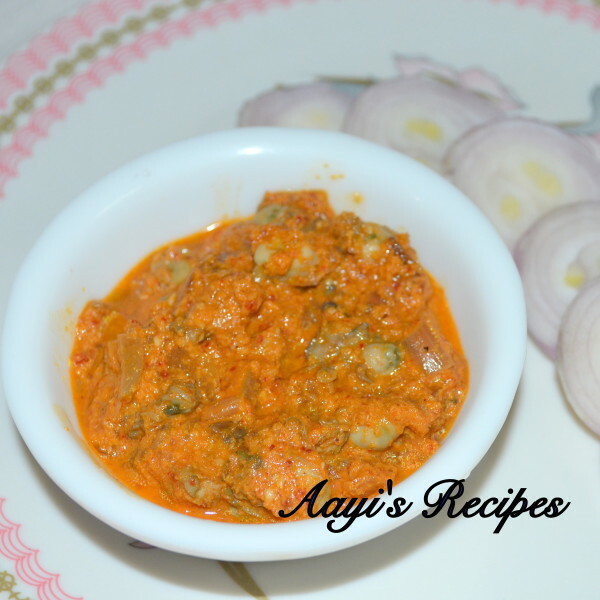 This is an authentic konkani recipe..North Canara style. In South Canara they don’t add onion. They make clams with hing . My mom adds potato and sometimes makes curry with drumsticks. Thank you!